You have the option of deciding whether the part is to be restored or replaced. If restored then you can create a list of restoration tasks that need to be undertaken on the part. As you can have common restoration tasks, such as shot blasting and chroming you can build up a list of these tasks and select as required. To help you get started we have included some common restoration tasks. During restoration and assembly it's likely you will need components parts to complete the job. Components include nuts, bolts, washers, gaskets, oil, etc. When adding the part's details to Restoration Manager, it's a good idea to complete this list - components that it's obvious you need now, may not be so obvious when you restore or reassemble the part, particularly if a component breaks or is destroyed during the strip down. If you own or have access to a digital camera you have the ability to take hundreds of photographs during the strip down that will prove invaluable when reassembling the vehicle. Once the images are stored on your PC, you can place a link to them in Restoration Manager, adding a brief description and notes further explaining what the picture is showing. Advanced functionality within Restoration Manager allows pictures to be zoomed in and out, allowing you to see an area in greater detail and rotate the image for a better view. Note the clarity when zooming in and out depends on the resolution of the camera - if you have the space on the computer we recommend taking photographs at the high resolution so that the picture can be examined in detail. Now, whilst entering all of this information is best done just after the part comes off, you don't have to do it then. Neither do you need to decide whether a part needs restoring or replacing at this stage either - you can do this, and change you mind later. After all, you may initially think a a part can be restored, but after cleaning it may need replacing. Restoration Manager gives you the flexibility to change this as the restoration proceeds. When adding a part for the first time, Restoration Manager will give you a unique part code. It's crucial to mark the part with this number in some way. If the part is to be stored in a bag or box, a label can be applied to the outside. For larger items labels can be either stuck or tied on. Restoration Manager can print labels with this information on using a Dymo label printer. This prints the unique part number along with the location of the part and the name of the part (assuming these have been entered) on one neat label. How you arrange the information in Restoration Manager is up to you. Aside from having the three phases, Strip Down, Restoration and Assembly, you can group parts together to suit the way you work. For example, with the valves in the cylinder head you could group all the valves together and treat the valve, spring, collett and top cap as one part or have the valve as the group and separate the valve, spring, collett and top cap as individual parts. Restoration Manager is flexible and works around the way you work - we don't believe that computer software should seriously change the way you work just because of the way it has been designed. It's all well and good putting information into Restoration Manager, but for it to be any use it's necessary to be able to look at it when you get to the restoration and assembly phases. Now, the tree on the left hand side shows phases of the restoration, plus groups, tasks, photos and components, so if you know what you are looking for it's relatively easy to find, for example, information on the dashboard. 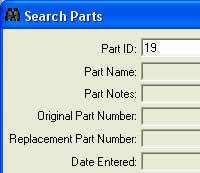 However if you have a part, with its Restoration Manager unique part number, you can easily work out where it came from and see any notes associated with it using the powerful yet simple search facility. Additionally you can search across notes and descriptions, invaluable if you know you made a note about something but can't recall where you put it. This is where Restoration Manager scores against a simple note pad. The job list shows the jobs required for a specified part or group in either the restoration or assembly phase, or both. 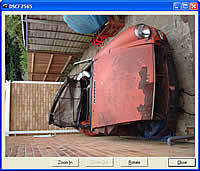 In addition you can list parts that require the same restoration task. This is useful when checking parts back in that have been returned from, say, the blasters. From the job list window you can mark the task as being complete. For the restoration and assembly phases, when a part has been restored or fitted the icon in the left hand tree contains a tick. When all parts in a group are completed the group icon contains a tick and so on until all parts are complete at which point the phase icon shows a tick. This gives a quick visual indication of the work carried out and the work left to do. In addition clicking on the phase icon will show count of the number of parts and groups, how many are complete and how many are left to go. The sophisticated report facility in Restoration Manager works as a search of its own. It allows you to create lists of parts that require a certain restoration tasks, which can be used as a packing list and check list when sending parts away, for example to be cleaned or chromed. Reports also allow you to produce shopping lists for activities, provided of course that you have entered the information. Remember, you don't need to enter all the information in when the part is removed, you can add components necessary for restoration or reassembly later having looked at the workshop manual and a parts catalogue. 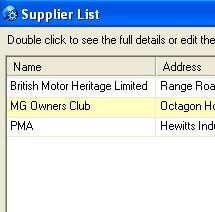 By allocating suppliers and part numbers to parts and components, it's possible to create a simple shopping list for an upcoming task - imagine having everything you need to complete a job at the weekend without having to go to the shop or having to abandon the job because you haven't ordered a specialist part. Your car or bike is finished and it's gleaming on the driveway. Now some people will keep the car, others will sell it almost immediately to fund the next project. If you plan to keep the project, provided you have used Restoration Manager to its full extent, you will have a fabulous detailed record of the restoration, including photographs, to show your friends and at club events. This information may also help when setting up agreed value insurance cover - the insurance company is more likely to agree to a value when they can see the work that has been carried out on the vehicle. If you've ever bought or though about buying a restored car or bike your first thought is going to be how well was it restored? If you've restored your vehicle and used Restoration Manager to help you, you'll have a detailed record of what work has been carried out and what parts have been replaced all with photographic evidence. What buyer wouldn't want to see that? You don't have to be completely restoring your vehicle to benefit from Restoration Manager. Any work over and above standard servicing can be logged in the same way as a full restoration. You can organise your projects and groups to suit the way you work - you could have one project per piece of work you carry out, or have it all in one project with individual pieces of work set up as different groups - Restoration Manager is flexible to fit in around the way you want to work. The benefits of doing this are the same as for a full restoration; a record of what you did when you dismantled the vehicle and what you plan to do with the parts - invaluable if the repair takes longer than planned and you have a record of the work carried out. Think about when you buy a car or bike - you want to see history. History of servicing, history of repairs. I believe the detail Restoration Manager can hold about work carried out beats a receipt for spare parts hands down, and so will a prospective purchaser. If your car or bike is a future classic, keeping a comprehensive record of repairs and improvements you make could increase the resale value and will make your vehicle much more attractive than a similar vehicle without this record. Restoration Manager runs on a Windows PC only with Windows 98/ME/2000/XP/Vista/7. Due to Windows 95 not being able to support USB (universal serial bus), which is how the vast majority of cameras transfer pictures, we decided to integrate advanced imaging software that didn't work on Windows 95. So, sorry if you were going to use a Windows 95 machine, it may work, but we can't guarantee it (no harm in trying a trial version). We would suggest a minimum specification of a Pentium 2 350MHZ (or equivalent) with 64Mb of RAM as a absolute minimum. As with everything computer related generally the bigger the better, and particularly if you plan to use the photograph functionality. To install Restoration Manager you need only 5MB of space, but if you plan to store a large number of good quality images you will need a lot more storage. Hard disk space is cheap and it's quite easy to add an extra hard drive to most PCs. Due to the amount of information displayed, you really need to have a minimum screen resolution of 800 x 600, showing as many colours as possible. The more colours that can be displayed at this resolution the more use the photographs will be. A quick search in the local paper and eBay found suitable computers available for as little as £50 - ideal for leaving in a garage or workshop. Possibly the best solution is to use a laptop. You can enter the information as the parts are removed from the vehicle and then update Restoration Manager with component and part information later, an attractive proposition if you are restoring in an unheated garage in the middle of winter! We have successfully tested Restoration Manager in a workshop environment using a Pentium 2 350Mhz processor with 128Mb RAM and 5 GB hard drive running Windows 98 SE and a Fuji 4700 FinePix camera. Download a trial version, fully functional just limited to one project and ten parts. And then unlock the trial version, keeping all of the information you have entered, by purchasing a serial number.